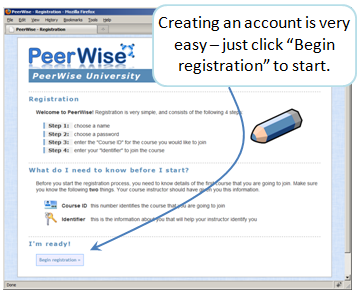 This guide provides an overview of the main features of PeerWise, to help you get underway. Log in using the account you previously created. If you have a new course to join, just click "Join course" on the Home menu. 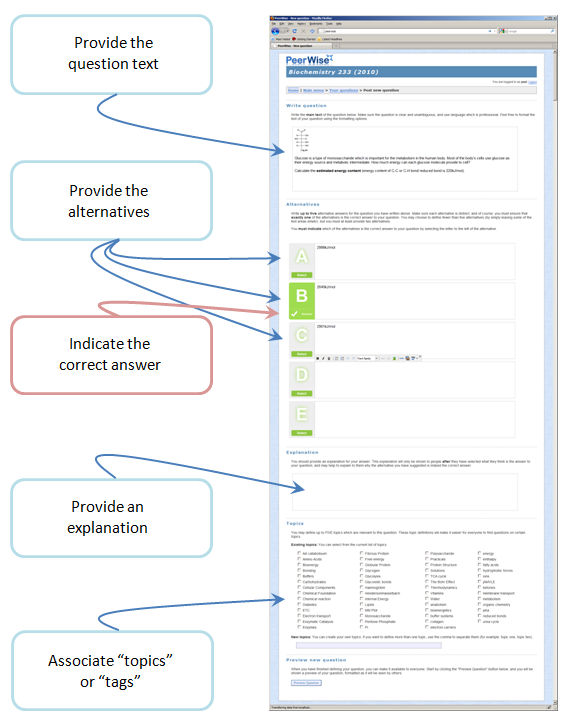 Once you have answered a question, you will be given feedback on the response you selected, and you will be shown an explanation of the answer. You will then be given an opportunity to select the difficulty level you think best matches the question and to give the question a rating, which you should think about very carefully. The "Your answer popular?" column indicates whether or not the answer you suggested was correct is the most popular one selected by your peers. Until there have been a certain number of responses to your question, the symbol shown in this column will be three dots (...). 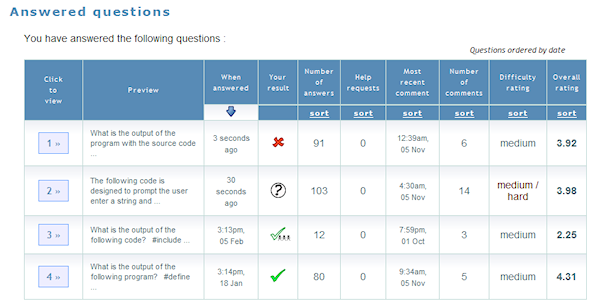 At any stage, you can review the questions you have answered in the "Answered questions" table. Your selected alternative matches the one the author of the question suggested was correct, and is also the most popular alternative selected. Particularly if the question is highly rated, it is very likely that this is indeed the correct answer to the question. Your selected alternative does not match the one the author of the question suggested was correct, which is also the most popular alternative selected. 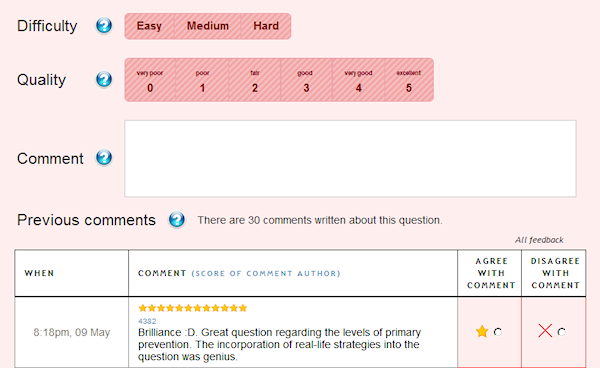 Particularly if the question is highly rated, it is very likely that you have answered this question incorrectly. The alternative you selected, the alternative the author suggested was correct, and the most popular alternative are all different. It is very likely that there is a problem with this question. You may choose to either agree or disagree with any comments previously written about a question. 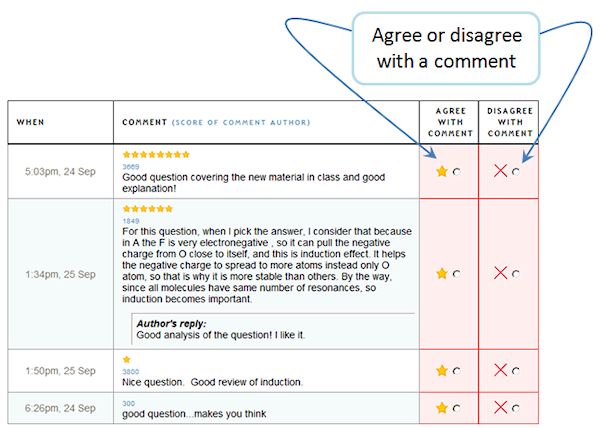 To agree with a comment, select the star in the "Agree with comment" column, and to disagree with a comment, select the cross in the "Disagree with comment" column. The level of agreement with the comments determines the order in which they are displayed. 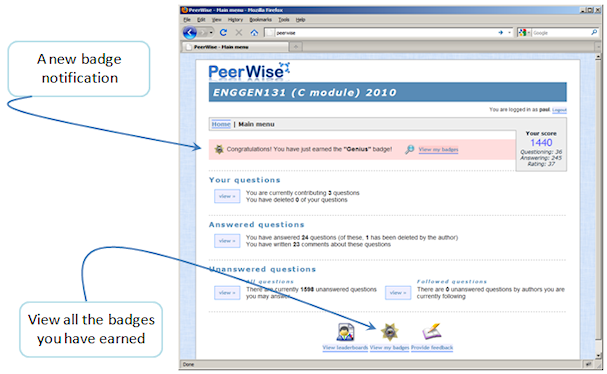 If there are many students contributing to PeerWise, there may be a large number of questions available for you to answer. One way to discover good questions is to identify question authors that are writing good quality questions. If you find a question that you particularly like, the author of that question may have also contributed other good questions. You can choose to follow an author at any time, and this will give you access to all of the questions written by that author. To follow an author, simply click on the "Follow" button when viewing the details of a question in the "Answered questions" section. Once you have chosen to follow an author, all of their questions that you have not yet answered will appear in the "Followed questions" section. 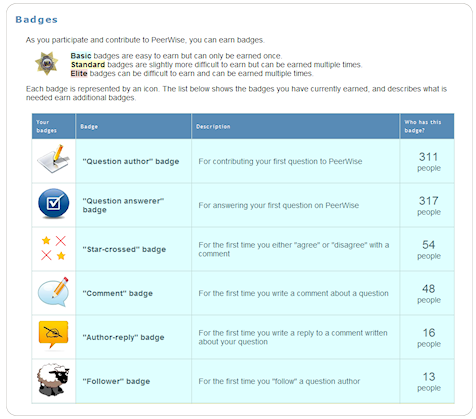 You can assign your own personal tags to any questions that you have answered. Personal tags are not visible to anyone else, but may help you later to locate certain questions again. To add a personal tag to a question, simply write the tag in the text box and click the "Add tag" button. 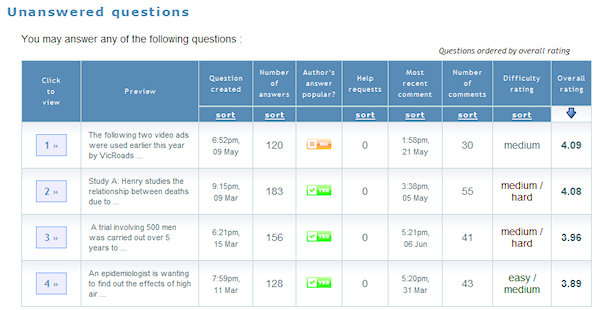 A list of the personal tags you have assigned to your answered questions will be displayed on the "Answered questions" page. Selecting a tag from this list will display only those questions to which you have assigned that tag. You can remove all of the personal tags you have assigned to a question by clicking the "Remove all tags" button. 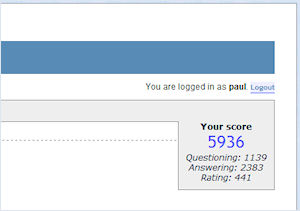 You can also browse the leaderboard, which includes tables such as the top rated questions, the most popular contributors and the highest scorers.